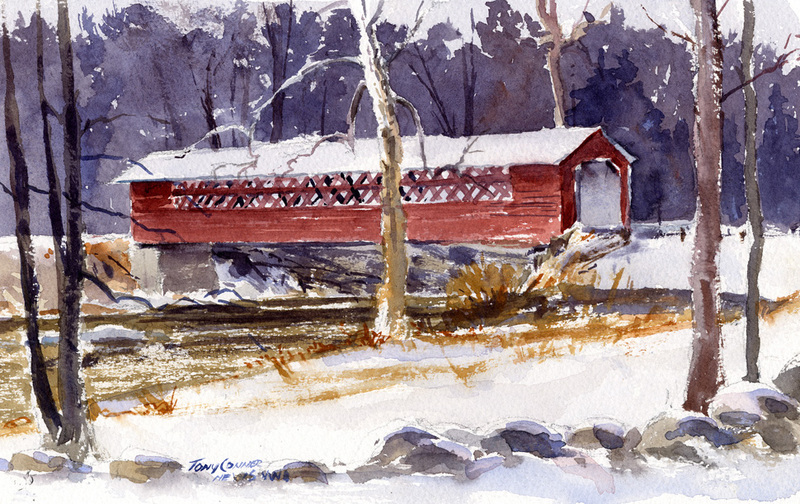 “Henry Bridge in Light Snow” – painting is approx. 7 1/12″ x 11″, matted and mounted to 11″ x 14″ for easy, low-cost framing. 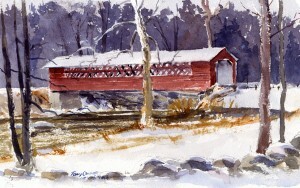 What better image to open a Winter Exhibit than with a covered bridge in a wintery landscape. The Henry Bridge is one of three covered bridges in Bennington that span the Walloomsac River. This day was overcast and light snow fell most of the time as I painted. With no direct and only weak sunlight filtered through thick clouds, there were no shadow and only subtle variations in color and value, especially on the snow covered areas. The challenge in any winter landscape is to find a way to include color other than blue-grays and low intensity browns. Including a painted structure, such as a covered bridge, is one way to do it. As I headed out to paint, I headed in the direction of this bridge knowing that it would provide color to a very gray landscape. This painting is approx. 7″ x 10″ and is mounted and matted to standard outside dimensions of 11″ x 14″ for easy, low cost framing.